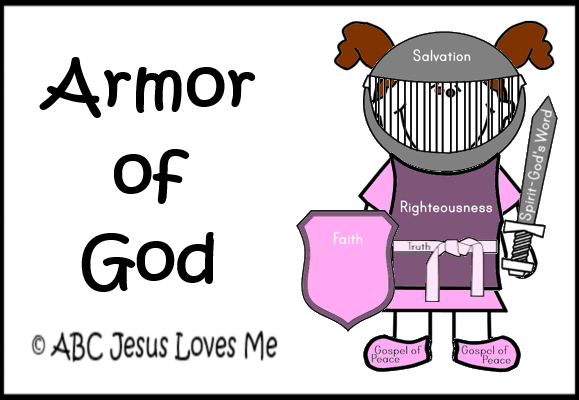 ABCJLM Bible Workbook: Color and cut out the Armor of God Kids worksheet pieces (1st page). Glue the armor pieces to the kids (2nd page). - Play educational games like Hi Ho Cherry-O, Candy Land, Go Fish, Memory, and 1-2-3 Stomp to review letters and numbers. - Put various magnetic refrigerator letters into a small bag or basket. Have your child draw a letter out and tell you the name of the letter, the sound it creates, and a word that starts with that sound. On a blank piece of paper, have your child draw his family and correctly trace/write the letters "My Family." Your child will be doing this activity periodically throughout the curriculum. Write the date on the back of the picture and save his picture to compare each time. The pictures should become more detailed with time.